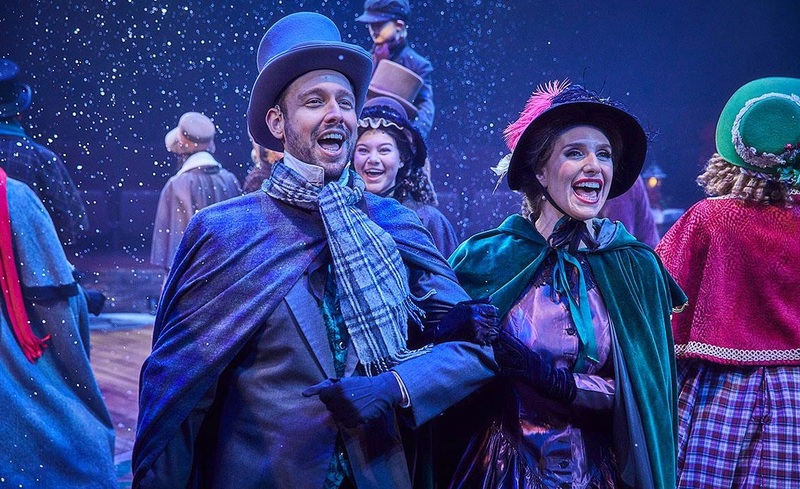 At Christmas time, entering Hale’s seasonally decorated theatre-in-the-round in Gilbert is like walking into the center of Victorian London. To the north you’ll see St.Pauls Cathedral, to the south it’s Westminster and the tower of Big Ben, and on both the east and west sides, the walls are decorated with houses and London business establishments, such as J. Odom’s Spirits. And in the center where the action will soon take place, standing on a raised platform is a uniformed London town crier, or bellman, a uniformed officer of the court, who greets everyone with a warm “Merry Christmas” as you check your ticket stub and search for your seat. Throughout the year, David Dietlin, owner and President of Hale Centre Theatre, shares producer and casting director credits with his wife Corrin. But at the beginning of the season, he changes caps. Since 2003 when the theatre first opened and presented its first production of A Christmas Carol, Dietlin has directed every one. The version used for Hale’s annual production is from a script faithfully adapted by Ted Lehman. It’s not simply a case of following the arc of the original work, the dialog, while edited, is practically verbatim. Lehman’s script even includes moments usually omitted from other productions, including the business gentlemen talking about Scrooge’s death and whether they’ll go to the funeral or not, though they never mention his name. They refer to the miser as Ol’ Scratch, a Victorian nickname for the devil. There’s also the business of Bob Cratchit’s daughter Martha playing a trick on her father on Christmas Eve, pretending she won’t be home and hiding; Scrooge’s nephew Fred playing a game of ‘Yes and No’ on Christmas Day with friends; the gloomy, sinister future sequence of Old Joe giving money to the ladies who steal the bedclothes from Scrooge’s deathbed, curtain rings ‘n all. There’s even the book’s short foreword from Dickens himself that introduces the production in a voice-over as the house lights dim. Many of those instances are either trimmed are absent from other presentations altogether, but Hale’s production has them all. In fact, Lehman’s script adheres to the original so closely, those odd moments when the production veers slightly away, as minor as they may be, can’t help but be noticed. The two charity gentlemen who call on Scrooge for a Christmas Eve donation conduct their business with him in the street, not in his office where the scene usually takes place. And when the Ghost of Christmas Present calls the old miser “You silly little man,” and drinks from a concoction called The Milk of Human Kindness, Lehman has taken these not from Dickens but from the 1970 Leslie Bricusse screenplay for the big screen musical Scrooge. 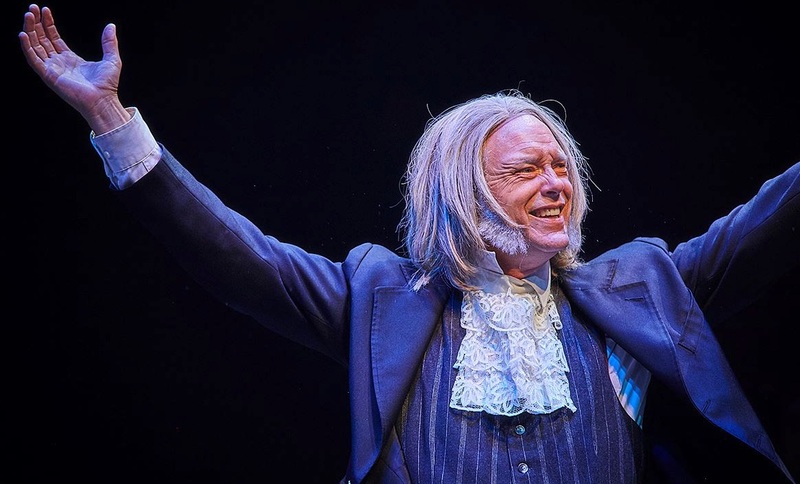 While the play and its presentation may be the same one you saw last year and the year before, what keeps Hale’s annual production seemingly fresh are the small but important differences director Dietlin incorporates into A Christmas Carol with each new version. Depending at what particular time of performance you’re seeing the show, as the play begins, the town crier rings his bell and loudly declares, “It’s eleven o’clock and all is well!” And if seeing Hale’s production is an annual event for you, you’ll notice a slight difference in the design of Scrooge’s bedchamber in the northwest balcony. This year the framed Dickens portrait – a nice touch – is in a different position on the wall. This allows for some new special effects to occur. Prior to Jacob Marley’s ghostly appearance, objects fly off the mantelpiece while Scrooge’s haunted wall clock lights up and spins wildly out of control. As with previous years, the schedule for the show consists of a single evening performance Tuesday and Wednesday, two on Thursday and Friday, and a whopping four on Saturday, beginning at eleven in the morning. This continues from now until the final two performances on Christmas Eve, Monday, December 24. Many performances are already sold out. Because of the exhausting demands on the actors, there are not one but two separate casts performing on alternate days known as either the Green Cast or the Red Cast. 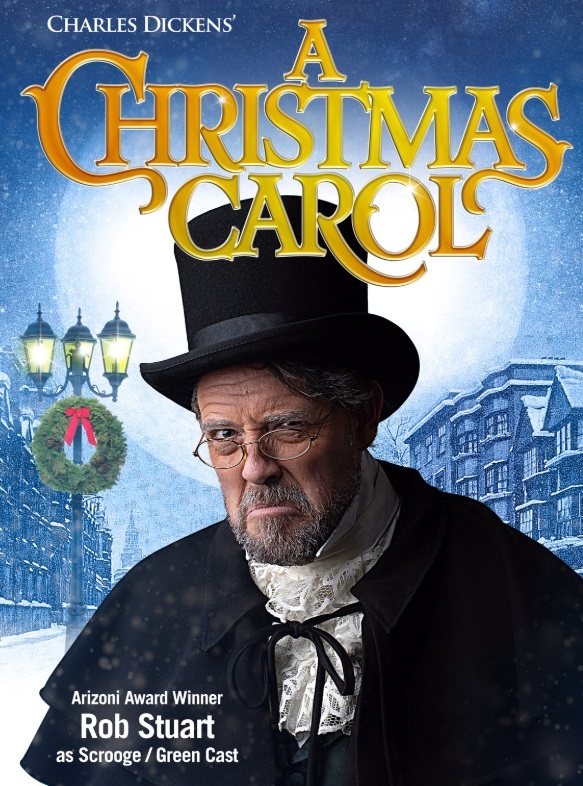 What you’re seeing is essentially the same production, but with different faces, plus two distinct different leads playing Ebeneezer Scrooge. 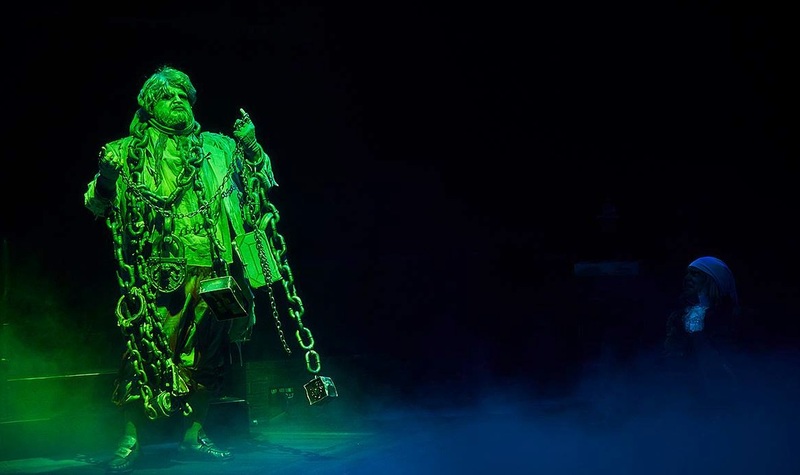 In the Green Cast, the old miser is played by Rob Stuart in his debut, while the Red Cast sees the return of comedian and local Fox TV morning personality Cory McCloskey. For the purpose of this review, it was the Red Cast production attended where a virtually unrecognizable McCloskey commanded the floor with a performance he so clearly relishes. 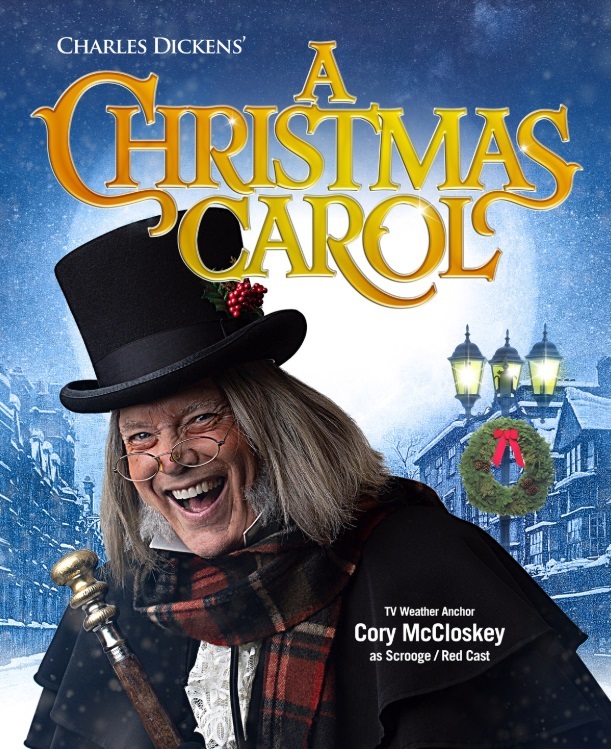 His Scrooge might be a little more animated than the one as described by Dickens, but within the context of a theatre-in-the-round where an actor has to be seen and heard by all four sides of the arena, it works. Plus, when Scrooge wakes on Christmas morning a changed man, that excitable high-energy of a reformed man giddily drunk on his own happiness is so thoroughly pleasing, you’ll feel like rushing the center and wishing him a Merry Christmas yourself. Presenting any show in the round and making it effective to the point that you forget you’re no longer watching a more regular proscenium arch production is not easy; certain shows simply don’t lend themselves well to adaptation. Yet with A Christmas Carol, the theatre has perfected its in-the-round presentation. After doing it annually for fifteen years, Hale Center Theatre has crafted a winning formula. 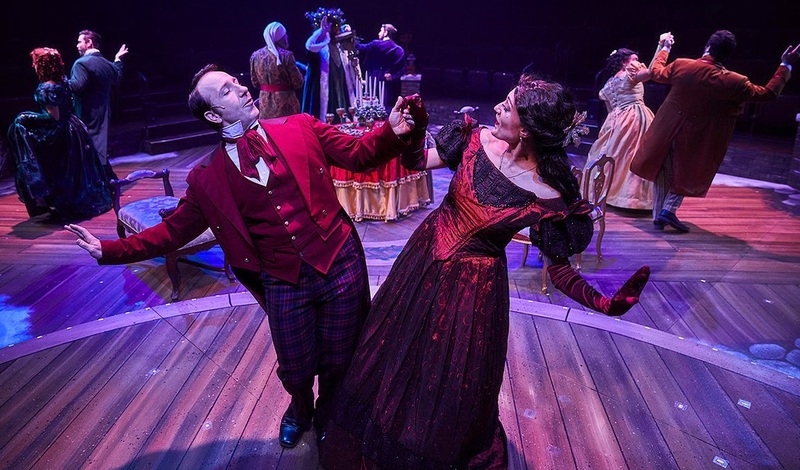 And if there’s one thing certain, David Dietlin clearly has a love for the Charles Dickens novel; you sense it throughout in the details of the play. God bless us, indeed.